The world population increases at a rapid pace, urbanization lies in wait, green areas are under pressure. The quality of a sustainable environment is determined by a balance between urban living and green areas. 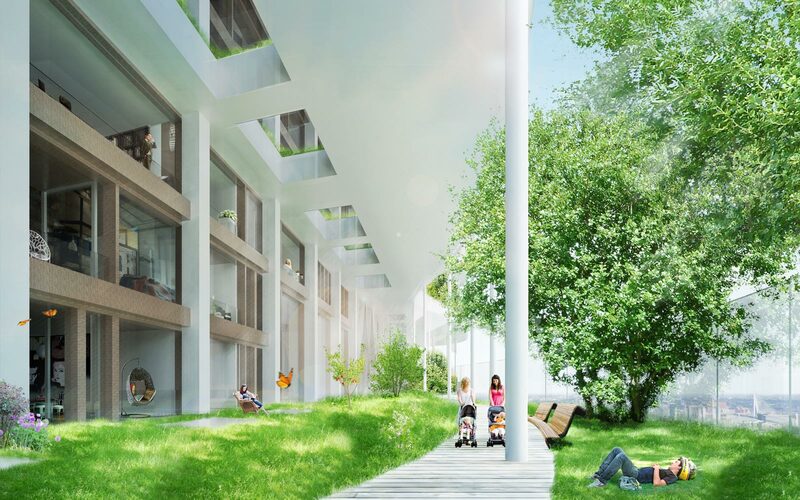 With green living city broekbakema creates a sustainable and vital urban environment in which ‘city and green’ naturally go hand in hand. 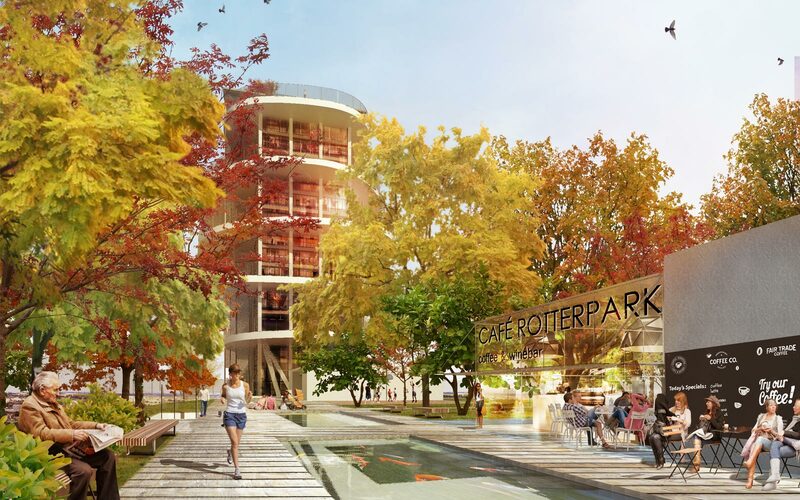 Green Living City is the name of an innovative study for a new urban typology in which Broekbakema searches for sustainable answers to questions about future urban developments. The study shows that living, working and relaxing in a high-rise urban environment goes well together. It also provides interesting input for a public debate on urbanization. 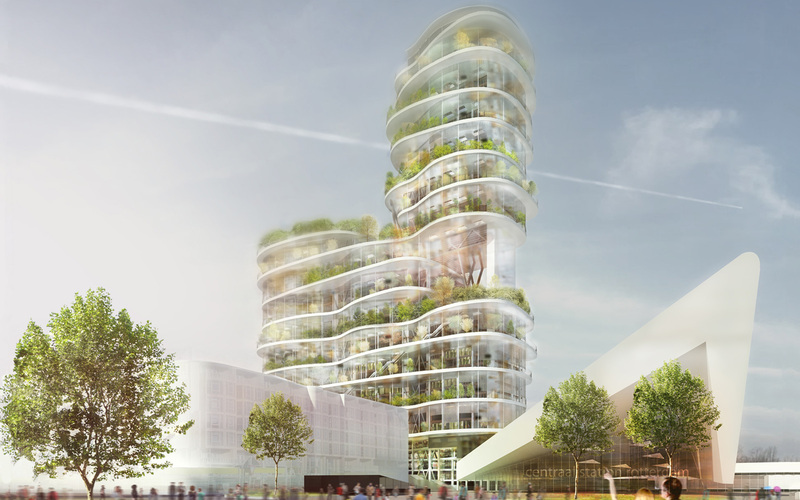 With Green Living City Broekbakema states that intensifying the existing city can only be accomplished by building it vertically instead of the common breadth expansion of cities. 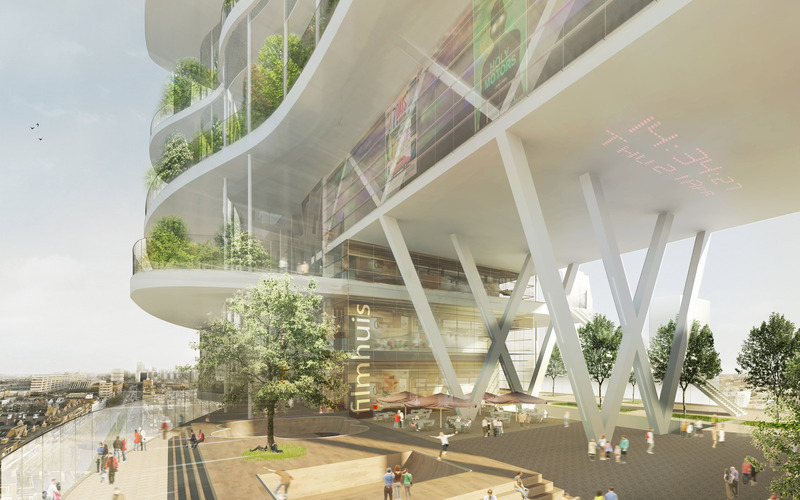 The Green Living City is literally developed in the vertical direction by stacking a mix of functions, including the public space. 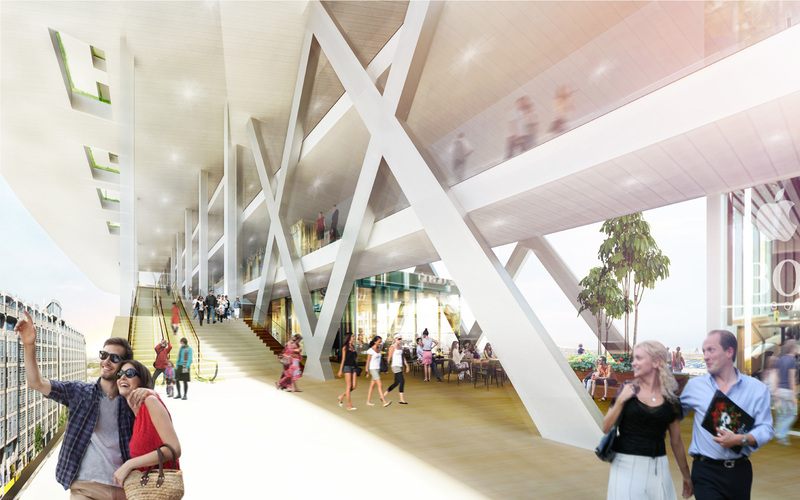 The concept is based on a permanent structure of large ‘super floors’ as ‘green public spaces’ with flexible, fillable and changable ‘pockets’ on top. These pockets accommodate various functions such as living, working and recreation. Several public routes ensure the accessibility of the public and green super floors and at the same time function as streets and city gardens. Next to that, just like any other city Green Living City has a number of urban squares and parks. These urban spaces are linked in a natural way through a public and inviting route. The verticality of the concept makes it possible to include multi-layered functions into one building, from houses to offices and sports halls to theaters. The mix of functions also contributes to the livability of the city, including the day-night rhythm of the city. In addition, the concept is particularly suitable to apply to different locations and at various scale sizes in a variety of designs. Sustainability is an important element of the concept. The ‘Trias Energetica’ strategy is naturally applied to it and consists of three basic rules: 1. Reduce the energy consumption by preventing waste, for example, a compact building form or isolation of facades and roofs. 2. Maximum usage of energy from renewable sources such as wind, water and solar energy 3. The most efficient usage of fossil fuels to provide in remaining energy needs. 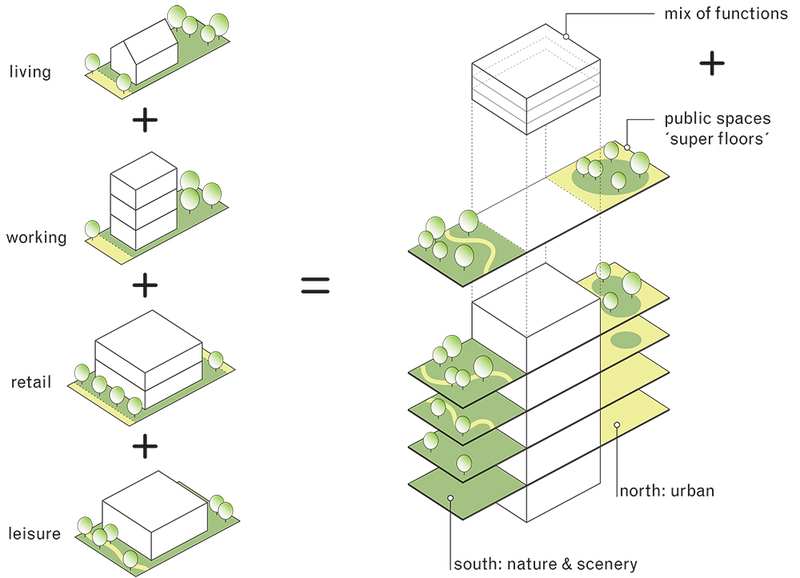 By stacking the several functions of a city , the footprint of the building is reduced to a minimum (compact building form), while its applications and the use of space are maximized. 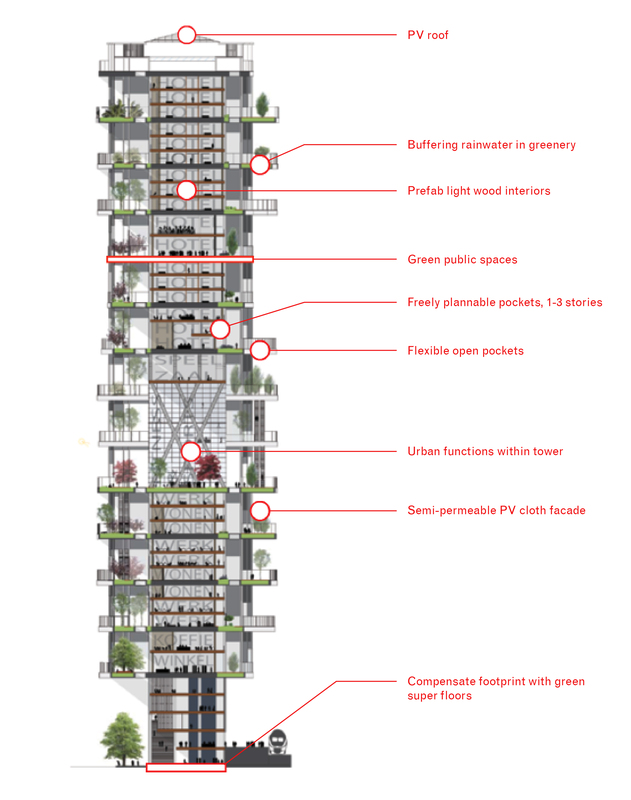 The existing footprint of the city is then maximally ecologically compensated by the green super floors. The permanent nature of the super floors, its construction, requires a combination of concrete and steel materials. Prefabricated materials are chosen to make the construction, in addition to solid and of a high quality, also as sustainable as possible. Because multi-functional pockets, wood seems to be an obvious choice, as it is a renewable material. Altogether, this creates a hybrid construction in which the permanent and temporary nature of the building are mutually reinforcing. To be able to ventilate in a natural way at high altitude the floors are equipped with wind and rain protection structures. This cloth, prepared with the latest technological developments, consists of a plastic fiber of a so-called ‘organic photovoltaic’ material. It is therefore also used as a sunscreen that absorbs solar energy and converts it into electrical energy for the building. The green super floors act not only as pleasant green public spaces, but also serve as a buffer for rainwater and contribute to the irrigation of flora. Biodiversity is also made possible by means of the green floorings. One of the largest expenses on energy consumption is lighting. Due to ensure that light reaches deep into the building, the use of artificial light can be reduced to a minimum. According to the BREEAM * principles, the building is entitled for the highest score, an ‘outstanding’ rating. * BREEAM is a method to determine the sustainability performance of buildings. The system uses qualitative weighting, a new building can get a total score in a range of 1 to 5 stars (Pass, Good, Very Good, Excellent or Outstanding).